Flaming June? Midsummer has passed and where has the weather gone? Ten boats entered the 7th race in the 8 race Cockwells Saturday series at FSC. Numbers were down as the Working Boats were holding their Championships in the Roads. The wind was a blustery North West with occasional squally showers and Race Officer David Cunliffe set the courses starting from the club line aided by Paul on the radio and Sue spotting. The tide was dropping and with wind over tide the starts were all about timing! Three yachts started in Q class at 1355 and all seemed to be unaware of the time. Minx, Charles Choak started with a genoa on port gybe and soon hoisted a spinnaker. Atalanta, Stuart Higgins went off under genoa and hoisted further down the course. Tai Mo Shan. Neil Chamberlain also flew a genoa, but being single-handed didn't raise his spinnaker! Four boats started in U class with Wilkie, Bob Chapple and Kaimana, Nigel and Jess Rowe taking an early lead under genoas. On Trifle, Chris Jelliss, we had set for port pole kite and delayed the hoist to make sure of the start line. Behind us Mr. G, Tim Dewhurst set an early kite and started to make ground. Once we set our spinnaker we managed to power through the lee of the two lead boats and forge ahead of Mr. G. Taking South Narrows buoy to starboard, a gybe and short run to Castle saw Trifle ahead. A lonely Sweet Friday, Len Cheshire went off in W class and two G class yachts brought up the last of the starters. Miss Agnes, Mike Rangecroft and Katy, Sue Grigg. Q class rounded West narrows to starboard and then to Carricknath again to starboard. 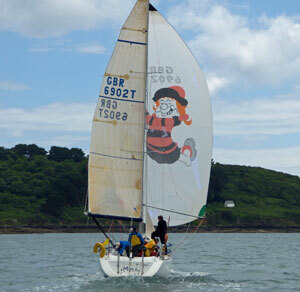 Both Q and U class then met up at Trefusis the windward mark and both classes then went round the previous course before returning to the turning mark at the club line. Mr. G managed to overhaul Trifle into 1st place just before the windward mark and held the lead from then in to the finish. We had the kite on the wrong side and did a spectacular windward launch on Trifle. All good things come to an end and nearing the South Narrows buoy for the second round Trifle rolled to windward and the kite wrapped round the forestay. It took the run down to Castle to sort and we then had the long beat back to the club. The gap between Wilkie, Trifle and Mr. G closed up as we approached the turning mark. Mr. G made it around and Trifle tacked onto port and crossed the bows of Wilkie. No call was heard but Bob Chapple said he had to avoid us so we did a one-turn penalty and carried on. Tai Mo Shan, single handed beat Atalanta by 58 seconds on elapsed time and Minx by 2 mins 34 seconds!! Well-done Neil remarkable sailing in such conditions. Mr. G beat Trifle on elapsed time but Trifle won on IRC handicap. Miss Agnes beat Katy by 1 minute 40 seconds. A rather disappointing turnout but the weather and Championships took a chunk out of the numbers. 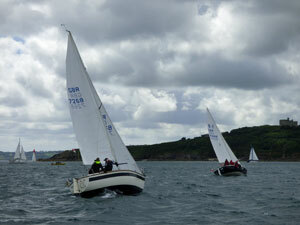 Point Penpol regatta next Saturday so no racing at FSC. Thanks to Cockwells our sponsors, the race office team and Pauline Cheshire for great teas and delicious cakes.